The day before Thanksgiving a new four-legged friend will be joining our family. 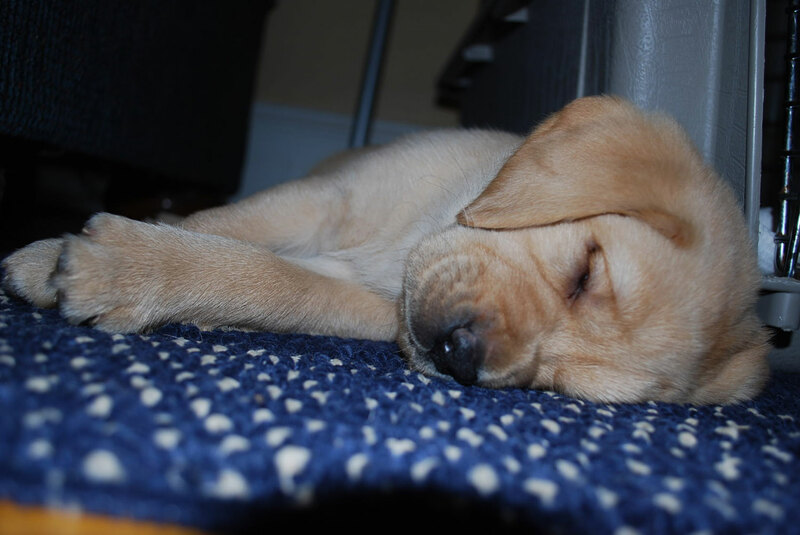 He’s a yellow Labrador puppy named … Indiana. Indy succeeds (never replaces) Madison aka Mad Dog, our yellow Lab who was an enthusiastic member of the Newquist household for 13 years. She passed away in June and left a massive hole in our day-to-day lives. Yes, it can be a lot of work to keep up with a dog, especially at the end of her life, when we were cleaning up messes every morning, but she was a constant presence and the one member of the pack who would always be happy to see you. Not having her here was like losing my shadow. Enter Indiana. I always loved the “We named the dog Indiana” line from the end of Indiana Jones and The Last Crusade and I’ve been kicking around the idea of naming our own dog Indiana for a while. When I wrote my novel for NaNoWriMo in 2007, the protagonist had a chocolate Lab named Indiana, and when Madison passed away – and we decided that our next dog would be a male – I knew exactly what his name had to be. Not everyone agreed with the name; my 7-year-old daughter was arguing for “Rosa Bella” and for us to get a female black Lab (or better yet, a German Shepherd Dog) and my 4-year-old son would rather have a kitten but this isn’t a democracy. They were infected with puppy brain when we went to pick out the dog, and StarGirl has decided that “Indy” is an acceptable name, so it should all work out in the end. As for the puppy, I know it has the potential to be a huge amount of work early on, what with housebreaking, late night whining, chewed shoes and early morning walks, but it’s balanced by puppy wrestling, learning to play fetch, and that first encounter with significant snowfall.